November 5, 2014 – Rohit congratulates the winners of the $25,000 Lucky Duck Nest Egg contest. 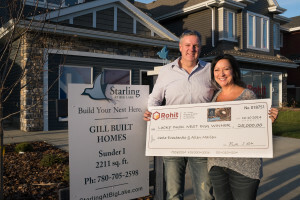 Allen Marien and Carla Evanshenko celebrate the big win, after purchasing their brand new Gill Built home in the nature-loving neighbourhood of Starling at Big Lake. The couple sipped champagne at a cheque ceremony held at the Gill Built Showhome on November 3, 2014. Gill Built and Rohit Land Development representatives were in attendance and learned how excited the couple is to be a part of the new community of Starling at Big Lake. Their move-in-date is in June. “We are excited to welcome this new couple to our community, and have them experience all of the natural amenities that Starling at Big Lake has to offer. We trust this extra support will aid them in making their new house a cozy Starling home,” said Kalina Davidiuk, Senior Marketing Coordinator for Rohit Land Development. Participants of the contest were able to choose a single family home from any one of our seven leading home builders and be entered to win the grand prize of $25,000. An overwhelming amount of entries were made between May and August of 2014.